In Las Vegas, dealers got a look at the new "Built Ford Proud" ad campaign, above, and heard directly from Ford CEO Jim Hackett. LAS VEGAS — The last time Jim Farley stepped into the Bellagio hotel's Grand Ballroom to address a national meeting of dealers here, Ford Motor Co. was on the brink of crisis. It was April 2008, six months after Ford had lured Farley from Toyota to help it steer through a steep downturn. A decade later, Farley was in the same room, again addressing an uneasy retail network questioning Ford's future. "It's a comeback story, but it's a different comeback story," Farley said. "We just happen to have a lot more money in the bank, but we want it just as bad. We want to be the best." Ford also has an abundance of skeptics, including Wall Street analysts, anxious employees and some of the dealers it spent last week working to reassure. It has even started to see customer loyalty, a longtime strength of the Ford brand, dip slightly, prompting a newfound marketing focus on retention instead of conquesting. 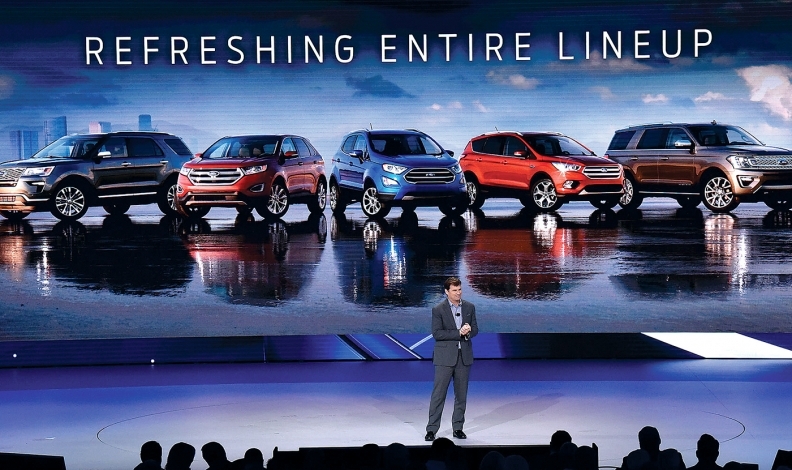 Ford used this year's annual dealer gathering to offer the clearest look to date at its plan under CEO Jim Hackett and to rally its retail body with an emotional appeal. It vowed to freshen showrooms through shorter product development cycles and revealed plans to add affordable nonsedan models to the lineup, alter vehicle allocations to raise profit margins and launch an edgy advertising campaign that plays up the company's history. Ford is trying to psych up its North American dealer body as it begins a difficult $11 billion global restructuring that will stretch into the next decade. While North American margins may be improving, Ford is losing money in key markets including China, Europe and South America and has indicated it plans to overhaul its operations in those countries. It's expected to post a decline in third-quarter earnings on Wednesday, Oct. 24. 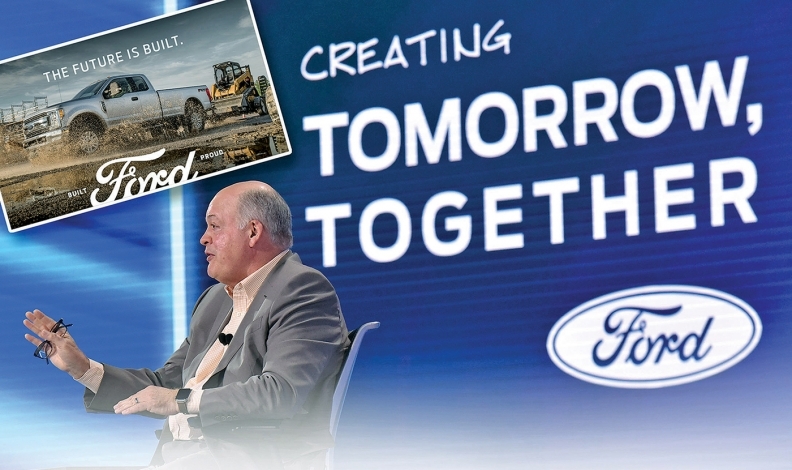 Ford has struggled to explain Hackett's vision for the company, and analysts have openly questioned his grasp of the business. Just three years removed from record profits, Ford's stock price has sunk to a nearly nine-year low — the shares, worth $11.10 on Hackett's first day as CEO, fell under $8.50 last week — and its North American product portfolio has grown largely stale. Morgan Stanley analyst Adam Jonas last week downgraded his rating of Ford and said the company's dividend, a significant incentive for longtime stockholders, is again at risk. The national dealer meeting is held every year, but often on a smaller scale with just a few executives. This year, virtually the entire Ford senior leadership team was there, including Hackett, who has acknowledged being not being visible enough to dealers in his first 17 months on the job. "This is the first time I'm aware of where he took the time — 20, 25 minutes on stage — and really gave an outlook of where he's been," said Mike Pallotta, owner of Pallotta Ford-Lincoln in Wooster, Ohio. "It was great to hear the message directly from him." 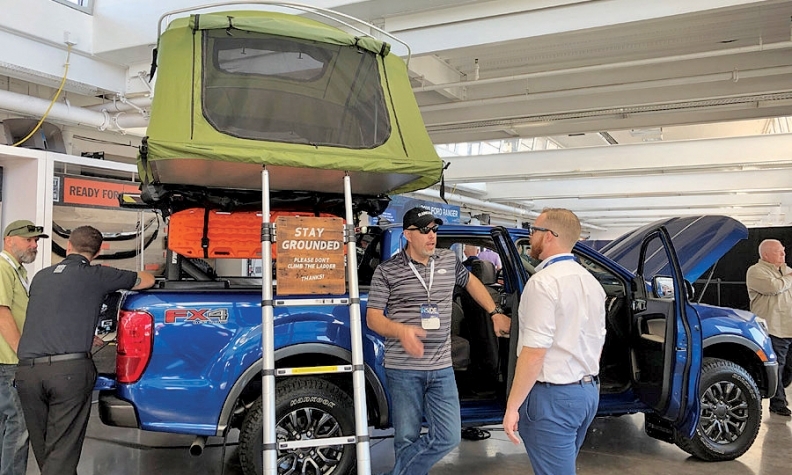 Dealers glimpsed new parts and accessories for the Ranger through a partnership with Yakima, left, and met with vendors demonstrating services such as FordPass, right. One of the dealer body's biggest concerns has been a lack of clarity on Ford's product strategy. Executives faced backlash this year when they announced they would discontinue virtually all of Ford's sedans in North America, offering only a vague promise of adding "white space" silhouettes. Dealers questioned whether Ford would abandon entry-level sedan buyers to General Motors, Toyota and other rivals. Ford showed dealers vehicles arriving in the next few years and explained how the total number of nameplates in 2023 would be three more than today. Farley, Ford's president of global markets, vowed to offer several vehicles in the entry-level, $25,000-and-under price point. "When you look at the showroom lineup, that's what really excites us," said J.P. Miller, chairman of the Ford National Dealer Council and owner of Paul Miller Ford in Lexington, Ky. "The vibe I got is that dealers are really excited that the showroom of the future is coming a lot faster, and Ford's commitment to keeping that showroom fresh." There was one notable exception to the future product showcase: the Bronco. Farley promised to show dealers "a Bronco" but only flashed a photo of his own classic 1973 SUV. Despite a lack of fresh products in showrooms today, executives have been working to bolster Ford's North American profit margins by more closely examining individual vehicle lines during a daylong series of meetings every Wednesday. Kumar Galhotra, president of North America, transformed one floor of Ford's headquarters to create 13 "franchise rooms," each dedicated to a specific nameplate. Farley said one of the biggest discoveries is how profit margin varies on a specific vehicle from region to region. Ford has started to allocate more inventory to the areas of the country where it can make the best returns. "If you start to see our North America margins go up, we have no new product this year, and it's not coming from the market," Farley said. "It's controllable within our company." Among the biggest changes Ford communicated for the first time was a pivot from focusing on conquesting customers from other brands to retaining loyal buyers. The automaker plans to center its marketing efforts on keeping customers in the fold, communicating with them more often through connected vehicles and offering perks through a new rewards program on its FordPass app. "When we did all the data analytics, it became really clear, a loyal owner is so much easier for us to do business with than trying to get a customer from someone else," Farley said. "It was a big 'aha' moment for us." Jim Farley, Ford's president of global markets, vowed to offer several vehicles in the entry-level, $25,000-and-under price point. Ford traditionally has had the strongest customer loyalty in the industry, although that number has dipped slightly through July this year to 63 percent, according to data from IHS Markit. One area in which Ford can target its consumer base: the 13.5 million trucks owned in the U.S. Ford plans to build upon those numbers with a new loyalty program in the U.S. next year. Ford declined to provide details but said customers can earn points to redeem for meaningful rewards and that the program was fashioned after studying brands such as Delta, Starbucks and Toyota. The plan also involves more post-purchase interaction with customers through connected modems, which Ford plans to have on all its nameplates within the next few years. The automaker wants to offer unique experiences, similar to how its Lincoln luxury brand has built a niche with features such as standard pickup and delivery and chauffeur services. "There's so much choice in our industry now, and there's so much great product," Farley said. "We really believe now, when you look at the new technology enablers, the next opportunity is to build a much more frequent relationship with the customer." Dealers started the meetings, called "Inside the Oval," with a series of hands-on experiences at the Las Vegas Motor Speedway. They were among the first to drive preproduction models of the Ranger midsize pickup through an off-road course and to demonstrate its ability on rough terrain. They took hot laps in Mustang Bullitts, drove the Edge ST, saw the new Police Interceptor hybrid based on the next-generation Explorer, toured new configurations of the Transit and Transit Connect vans and experienced demonstrations of products such as FordPass, B&O sound systems and Ford's telematics service for fleet customers. They were among the first to see about 150 parts and accessories for the Ranger offered through a new partnership with Yakima. And they could enter their name to win rides in the GT supercar. Back at the Bellagio, they met with Ford executives in various conference rooms plastered with messages from the automaker's new "Built Ford Proud" ad campaign. One wall featured the Bullitt with the phrase "Never on Autopilot," while another showed a sprawling manufacturing plant with the words "Small batches should be reserved for whiskey." Dealers also glimpsed a number of TV commercials that were to begin airing Saturday, Oct. 20. The meeting concluded with an emotional call to action from actor Bryan Cranston, the "Breaking Bad" actor who stars in the new commercials. "It's time to bring swagger back to the Ford Motor Company," Cranston said in a voice-over played amid shots of the company's products. "It's time to have pride in who we are and what we do. It's time the whole world knows how proud we are of our family name, and it's time we take pride in the vehicles we make, of the future we will shape and of the responsibilities we will take." Ford will place next self-driving fleet in Washington, D.C.